This colourful, sweet pizza is genuinely interested in cheering you up on a grey day. Cut the sweet potatoes into little cubes and boil them until they are semi-soft. 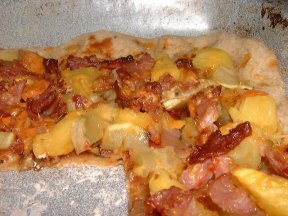 Cut the ananas and bacon into pieces of suitable size. If you want crisper bacon, you can barbecue it sligtly in the oven before giving the pizza base a coat of tomato puree and adding the seasoning and all the ingredients. Bake at 175°C until the edge is light brown.